I know that regular readers may have already picked up that I am a Catholic Dad, but my point here is that I am now part of the group blog "Catholic Dads". This means that I will be adding my bit to the collective output of many other Catholic fathers posting on various fatherhood and family related issues. What's so great about children? Gerald of The Cafeteria is Closed asked the question "What's so great about children?" There are lots of comments (64 at last count) but I thought the question deserved an answer here. I have always looked at these type of "Meaning of Life" questions in the same way I solve business issues at my clients. Take a step back, strip out the answers such as "But we have always done it that way!" and do a Chesterton type examination. By the way, you can't really plan children. You can certainly say "No", but you can't guarantee children will arrive by saying "Yes". Anyway the benefits of children depend greatly on the manner in which you accept them. If you treat them as a burden or expense and focus on the ways they cramp your lifestyle, take away your freedom and give very little return for all the trouble you have taken - then they aren't great at all. This is basically the so-called Devil's Advocate position Gerald posited in his post. But it's all rubbish. Let's use the same arguments with a new car. Why bother with a new car? It just costs money, fuel is so expensive and smelly, it gets dirty and you have to clean it, the expense is constant even if you don't use it with taxes and fees, there's no more together time as you are driving everywhere, you lose fitness rather than walking, you have to park it somewhere. And once it gets too old you have to sell it or trade it in on a new one and lose more money. Gosh, why would you get a car anyway? So, ignoring the silly short sighted criticisms of children, the primary thing children actually do is create parents. Parents are forced to grow up and take responsibility for their actions. They cannot continue to act like teenagers with lots of money. A Dad and Mum now need to consider someone else. Someone who amazingly looks like them and shares many of their own characteristics - both good and bad. And do you know the really surprising thing? The more the parents embrace their new roles, the greater the grace of marriage acts on them. They grow closer together despite the reduction in "Me" time. It's the "Us" time that is actually more important. The children react to the unselfish love and respond in kind. Even children that go to school and are bombarded with "Me! Me! Me!" messages all day can still survive with their family love intact as love is quieter in volume but much more invasive internally. Love sticks. Children are able to multiple love. Each additional child does not mean the same love must now be divided again. Somehow each child increases the total love more than in a straight mathematical line. If the love between Dad and Mum is 2, a baby makes it 3+x and another is 4+x+y and each one adding more again. This is all contingent on accepting and treating each and every child as a gift (which each child is). 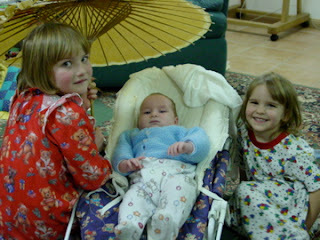 We have found the other great feature of children is they are fun (see the 11th reason) The photo with this post is of Clare and Rose playing with Martin. We have been told that younger children in large families tend to be missed out and suffer isolation. Bah! Younger children get spoiled if anything with too much attention from all the rest. While Ariel only had Lana and I, Martin has 8 other people to give him some attention on lots of different levels. So, what's so great about children? They made us grow up. In growing up we have enjoyed life far more and participated in so many activities we would never have experienced. Brrrr. What's all this white stuff? Last night was REALLY cold. Ariel awoke early to make her famous Strawberry Cheesecake muffins for the local shop. With frost on her breath INSIDE she went to the barracks and found a jumper (sweater). It was -6 C (21F). I know all you hardy Northern types think this would class as mild Summer weather but for us this is COLD! Naturally the boys rushed out and explored the transformed back yard. 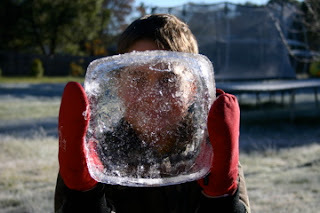 Here is Peter looking through the frozen remains of an ice cream container. 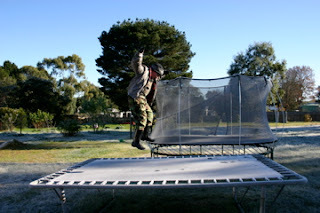 James, meanwhile, figured it would be fun to use the trampoline rugged up in many layers of clothing. I asked Ariel, "What do you think of the cold weather?" Without hesitation she answered, "I don't like it!" My main problem was that the pipes were actually frozen so we had to wait a short while until the sun melted enough of the pipes so I could have a shower. It's the little things that matter! Martin is now about nine weeks old and is a very important member of the family. Oh sure, he always has been since he first started as a little dot in Lana's womb, but now he is interacting and that means he is part of the fun of family life. I have always given each child a probation period of three months before they must start paying rent. Rent of one smile per day. Luckily they all start smiling around seven weeks or so. Just as sleep deprivation kicks in, every parent wonders "What is the point of all this trial?" 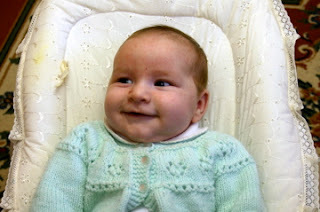 Then the baby gives a huge grin (and a burp,gurgle and wind) and you look into his intensely staring eyes and say, "OK. You can stay. Now go to sleep." But the really good bit about the interaction is you can play games with the baby. 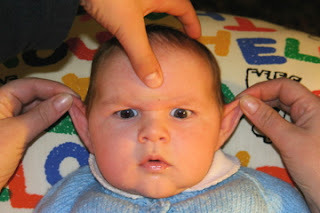 Here is Martin doing Yoda impressions. Although he isn't green. I was in my office checking emails and Eric came in, "Dad, get the camera. This is funny." So I stepped out and all hands assisted in giving Martin his first posed Bruggie Tales photo. I think this will work for his 21st birthday photo montage. 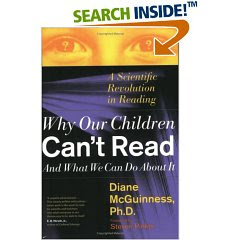 I heartily recommend Why Our Children Can't Read by Diane McGuinness. This is a fascinating work covering research into how reading should be taught. The first section covers the disaster with US illiteracy rates. Even phonics had a 33% failure rate (school stats) and the current hybrid whole word/phonics system of 42%. The problem lies in what the English language is and how the alphabet represents the language. There are 43 sounds but only 26 letters (and some of these are hardly used or are duplicates). So we cheat. To complicate it further we double up the same sound being represented by multiple letters or combinations, and the same letter/combinations making different sounds depending on context or surrounding letters. The history section of the book is fascinating and the part comparing other alphabets for different languages is almost worth the book alone. The golden part is the understanding that the way to teach English is to remember what we are doing. We are not trying to say that the letter makes the sound (phonics), or just remember how a word looks (the ludicrous whole word method) but that the sound is represented by this letter or letters. I ran the included sample tests with the younger children and it all made sense. The author has studies backing up the use of this method as being 100% successful. 98% within a 12 week training schedule and the remaining 2% requiring a further 6 or so weeks. So, I am now reading Reading Reflex which is all you need to start the training. Ariel and Eric picked up reading quickly enough, but the others are finding it more difficult. When I tried the new technique (what letter represents this sound) it is all starting to click. At $22.44 for both these books together, I am very happy. I visited a client in Broome a few weeks ago. Have a look at the map and you will notice that Broome is in the top left corner of Australia, a very long way from here and a long way from everywhere else in Australia. This is the first time I had travelled so far North West and I was very surprised that everything was so RED. If you ever want to film a movie about Mars, just go West from the coast. On the return trip I flew direct from Broome to Sydney. This is a 5 hour flight in a straight line. Around half way the plane banked to the left and then straightened. "That's odd," I thought. 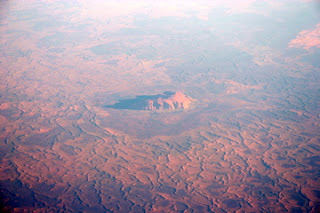 About 5 minutes later the pilot announced, "On the right hand side of the plane you should be able to see Uluru or Ayer's Rock." Naturally I took photos so I could show the family. This photo is enhanced to remove the high level mist in the air. Notice how bleak (and Red) the land is surrounding Ayer's Rock. Imagine how the initial explorers travelled over the bleak, dry land a long way from any civilisation with no long range communications. Amazing! I have always been told that my father came from Belgium. I even visited there in 1991 and met relatives and saw some cloudy skies and some cows. Well now thanks to the truthful nature of all that is on the Web, I have discovered that Belgium doesn't actually exist. It is all an illusion! On reflection, I suspect that the story may not be fully correct. This is a photo of a collection of our towels. Note they all have a common shade of purple. 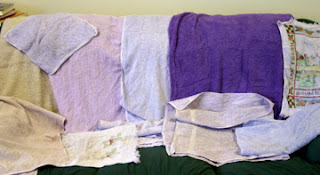 The really bright purple towel is a new acquisition and is a very nice towel. All the rest used to be white, orange or other light shades. Lana mentioned to her Mum, "Mum, this is a new towel, it may leak some of the colour." "Yeah, Oh, OK." Mum said distractedly as she gathered a posse of towels and threw them in the wash.
A little later Mum approached Lana, "I've had a little bit of an accident..." and showed us the newly re-coloured towels. So all the towels have been freshened up. It's like having a whole new co-ordinated collection of towels! We used to be very careful using the ubiquitous phrase "Mate" when we lived in the US. Saying "Thanks, mate" would be matter of course here in Australia, but stopped the conversation over there. Thankfully, Tim Blair has explained the various shades of meaning to the phrase "Mate" in this article. You scored as Knightley, Your husband/boyfriend is most like Mr. Knightley of Emma! He probably gives you kind lectures to help you in certain matters, though he does these out of true devotion and in your best interests. Others look to him for his wisdom and good sense. He is generous and steadfast, though not afraid to politely argue with you. The two of you enjoy a challenging, sweet partnership and are most likely very active in your community.